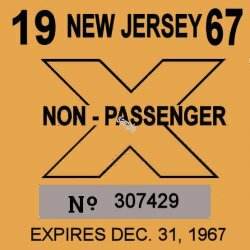 1967 New Jersey TRUCK Inspection - $20.00 : Bob Hoyts Classic Inspection Stickers, Add a Final Touch to your Restoration! This 1967 NJ Inspection reproduction truck (Commercial) Inspection sticker was taken from an original and beautifully restored front and back. These stickers were used on any type of truck if it was used for commercial purposes. Some small vehicles such as the El Camino could be used both ways, as a passenger vehicle or a non-passenger if it was used as a truck in a business.